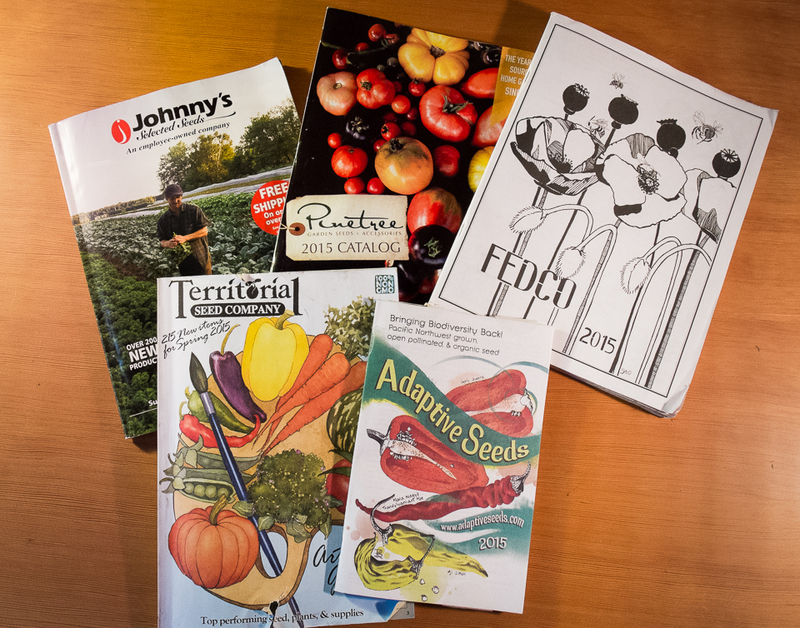 There’s a lot to distract the kitchen gardener trying to put together seed orders for the year ahead. For starters there’s the “New For This Year” page at the beginning of every catalog, hard to resist pausing over before turning to the catalog proper. Once into the listings, there are the names of each variety, sometimes descriptive, occasionally amusing or even puzzling, and then, in engagingly written paragraphs, the story behind each seed and its particular traits of cold-hardiness or early ripening, taste or nutritional value. All these details invite a pause to compare possibilities and wonder whether to stay with an old favorite or take a chance on an intriguing new variety. A new distraction in recent years is the unusual colors of vegetables that traditionally came in one color, orange carrots now in red, yellow or purple, snowy white cauliflower now in green, orange or lavender. Are these simply novelties or improvements? Would they taste as good as the original? Are their flavors and colors better raw or cooked? A final pleasant distraction for the kitchen gardener is imagining meals from vegetables that haven’t had a place in the kitchen garden for a while or have never had one. Is this the year to grow a few Savoy cabbages again, to grow broccoli raab instead of relying on spring kale buds or maybe to plant some rows of flint corn to dry and grind for polenta? I’ve been spending the past week indulging in all these distractions as I page through favorite Maine catalogs, Fedco, Johnny’s and Pinetree, Oregon’s Territorial Seed Company, British Columbia’s West Coast Seeds, and some wonderful, smaller Pacific Northwest seed company catalogs in print and online, Adaptive Seeds and Wild Garden Seed from Oregon and Uprising Seeds from Bellingham, Washington. I’m getting close to finalizing orders, to finding a balance between old and new, familiar and startling, between comforting tastes and exciting new flavors. While non-orange carrots seem a bit trendy I’m tempted to order some purple, red and yellow carrots. Many companies offer Purple Haze, a 2006 AAS winner, and Yellowstone, a truly yellow carrot. Uprising Seeds offers Dragon, a dark red to purple carrot, claiming that it’s spicy and sweet. New this year at Territorial is Red Samurai, “a great tasting true red carrot.” I’ve been roasting my favorite orange Mokum carrots sprinkled with cumin and coriander seeds following a recipe in Yotam Ottolenghi’s inspiring new cookbook Plenty More (2014). Adding purple, red and yellow shades to this mix would be pretty on a summer or winter table. Flower buds from kale, Brussels sprouts and mustards are an early spring treat, sweet with only a slight cabbage flavor. Broccoli Raab looks similar but has a much more pungent flavor. Whenever friends serve it, I wonder why I don’t grow it. It’s so delicious. This year I plan to. Territorial carries Sorrento and Fedco carries Quarantina, meaning “40 days,” the time to maturity for this fast-growing Italian green. I’ll plant it for a fall and early winter crop. Fedco and Adaptive Seeds offer Abenaki flint corn, described by Adaptive as “best for polenta, grits and wet batter cornbread” and “tolerant of difficult growing conditions.” I have success ripening sweet corn listed at 70 days to maturity so I’m optimistic that Abenaki, listed at 80-90 days to maturity will ripen so I can experiment with grinding our own polenta. Soft, warm polenta topped with sautéed greens or roasted vegetables is a favorite winter meal as is polenta cooled, sliced and grilled and served hot with sausages or pork chops. Of all this year’s seed order candidates, this one will be the biggest experiment. All of these distractions are part of the pleasure of planning a kitchen garden, a perfect way to spend early January days. I’ll send in the orders in the next few days and soon boxes of seeds will arrive at the mailbox carrying the promise of many delicious meals in the garden year ahead.